The 2018 official Jerusalem Transportation pdf Map is entirely in Hebrew so difficult to understand for those who can’t read this script. 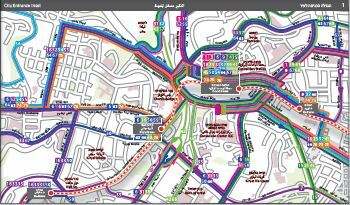 An earlier pdf map with information and labels in English was produced in 2012 by the Jerusalem Transport Master Plan team and includes the network of bus routes in Jerusalem, express bus routes, the light train route, and ‘park and ride’ locations. It’s not entirely up-to-date but still gives a helpful overview. Click the thumbnail map below to see the map. It’s a big pdf file, so it may take a few seconds to open. For a more up-to-date information with an English language option, see the trip planner at planner.tm-it.co.il and the unofficial but useful and regularly updated map on Oren’s Transit Page.